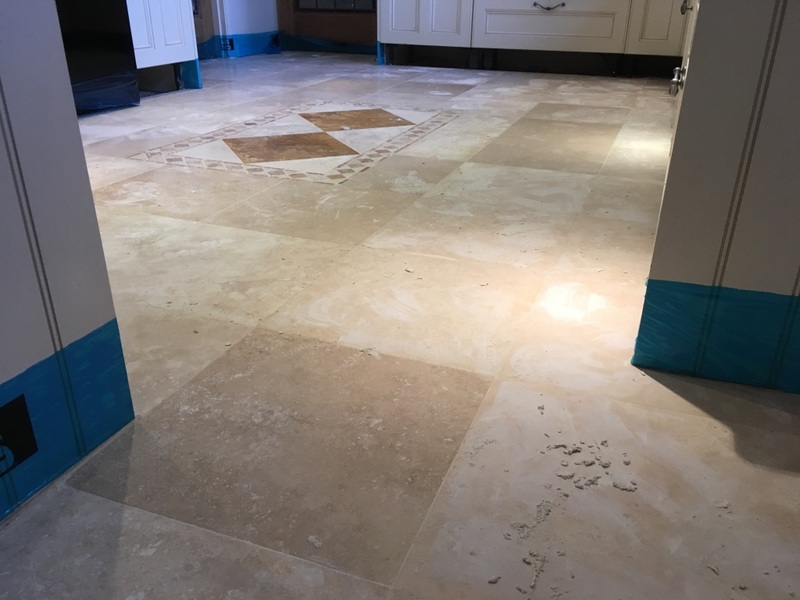 Earlier this year I went to look at a Travertine tiled floor at a property in Limpsfield Chart near Oxted in East Surrey. 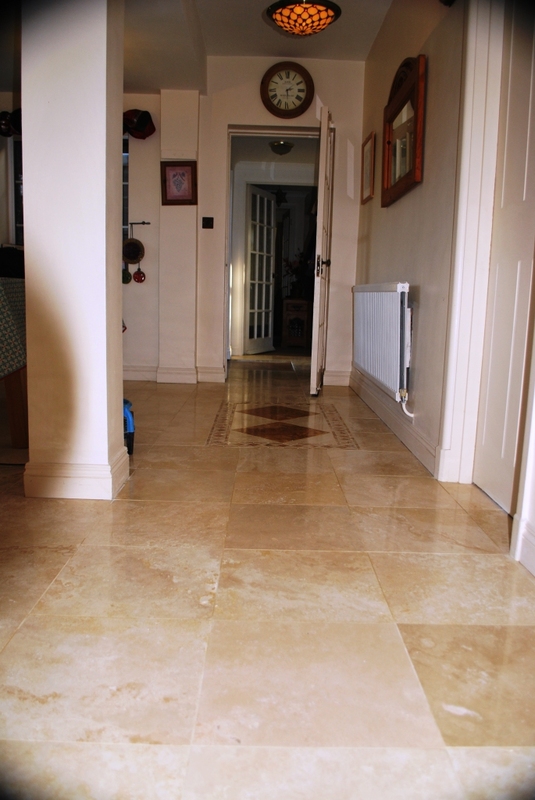 The travertine had been laid throughout the Kitchen and adjacent dinner and my client was having trouble maintaining its appearance which had now become dull and unappealing. 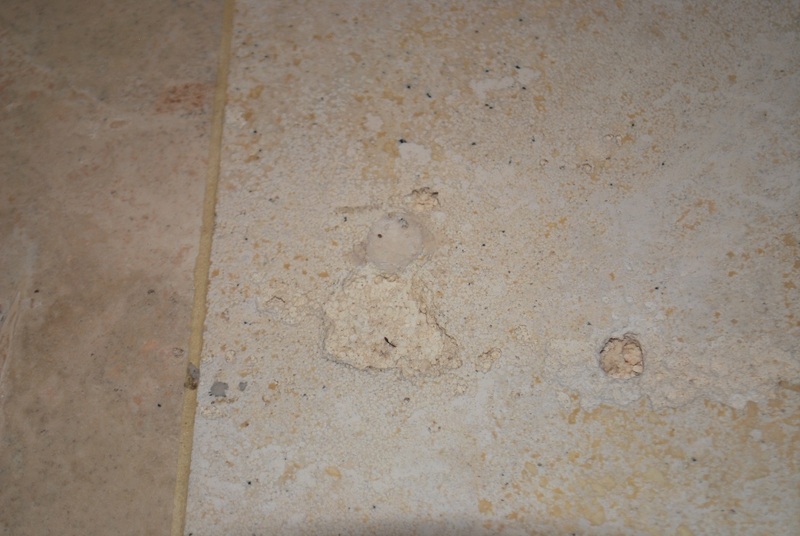 The Travertine tiles also suffered badly from pitting and dirt had become lodged in the pits of the stone making it difficult to clean. 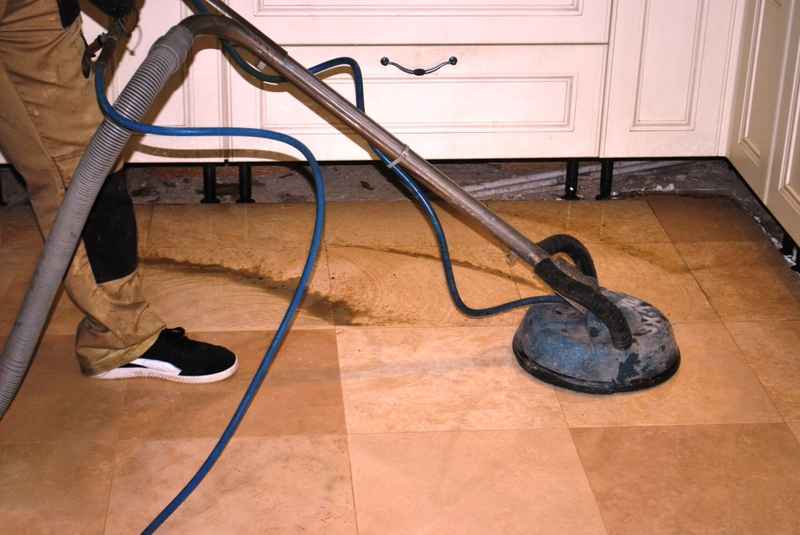 In addition, there was also some staining to the grout lines that needed removing. 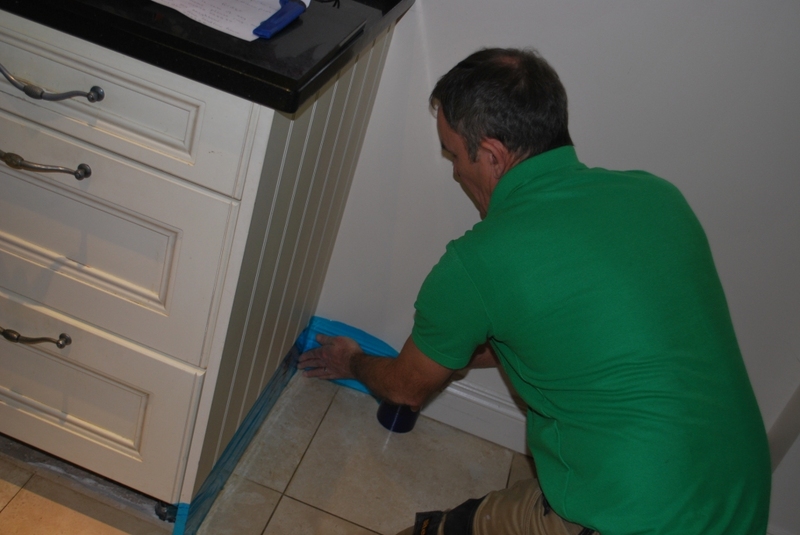 First, we removed the kitchen kickboards and applied protective tape to the skirting boards and around the fridge. Then a strong dilution of Tile Doctor Remove and Go was sprayed onto the tile and grout and left to soak in for fifteen minutes. 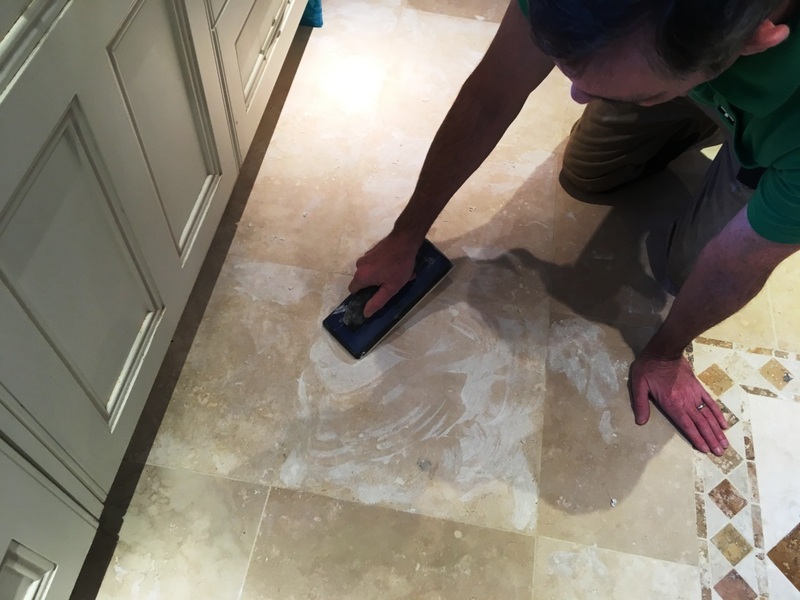 Remove and Go is designed to remove coatings from Tile and Stone such as sealers so after leaving it to dwell on the floor it was worked in using a rotary floor buffer fitted with a polypropylene brush. The grout lines were then scrubbed by hand paying particular attention to the stained areas. Once that was down the now dirty Remove and Go was rinsed and extracted from the floor using a spinner tool which uses a compressor to apply hot water at high pressure and extracts the slurry into a waste tank. 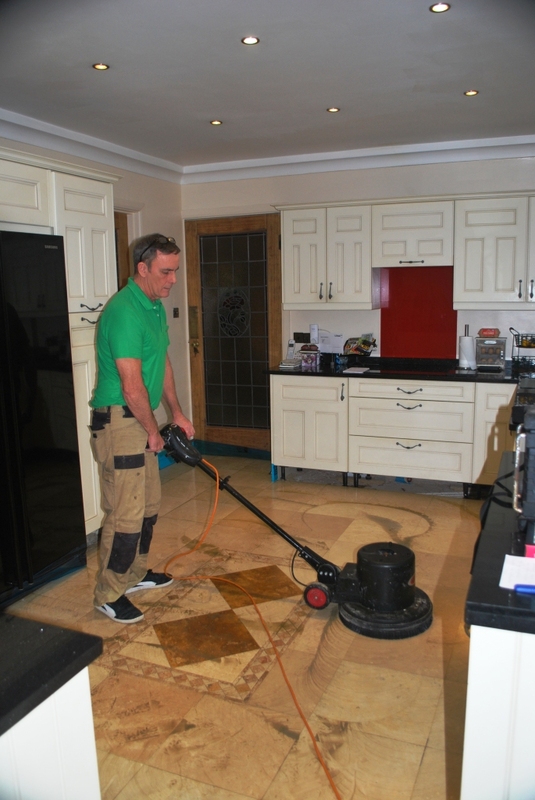 This process was applied first to the kitchen and then to the adjacent dining area. As the floor dried, I spent the rest of the afternoon filling the pits in the Travertine tile with grout, almost every tile was affected so it took some time. The grout was then left to harden overnight. Returning on day 2 a 400-Grit burnishing pad was applied dry to both areas to smooth off the grout that had been applied to the pits the previous day. 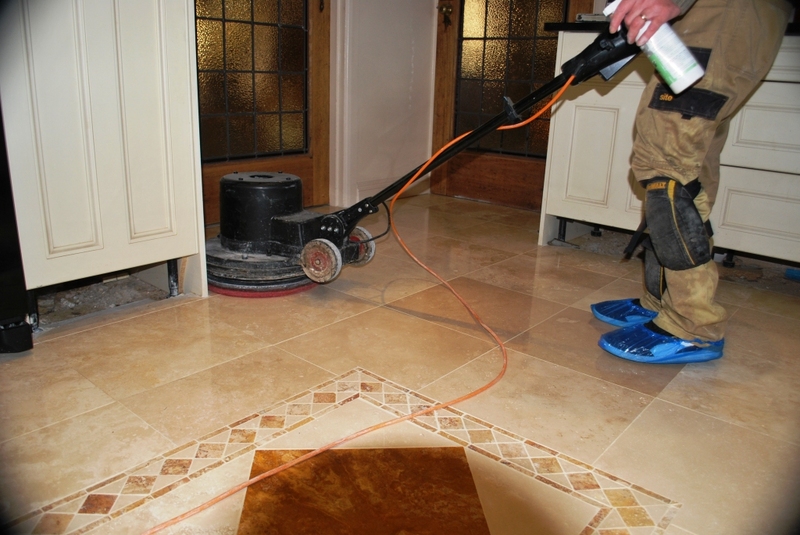 Only a single pass of the pad was required to remove the excess grout which was then swept off the floor. 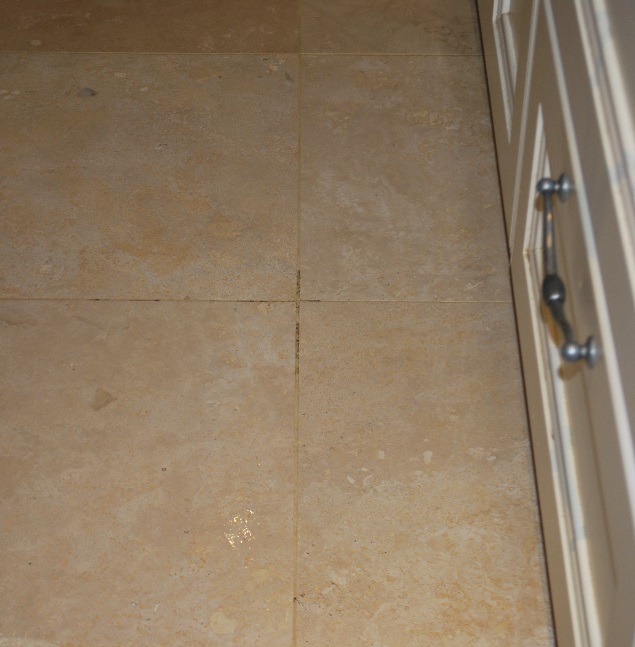 The grout blended in perfectly with the Travertine which was a mixture of brown and white shades. 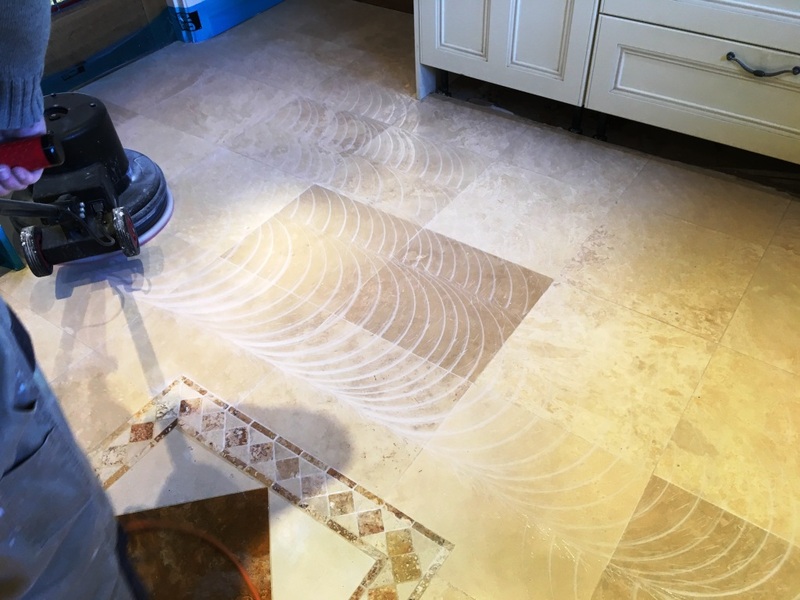 With the pitting issue resolved I set to work restoring the polished appearance of the tiles for which I used a set of diamond encrusted Tile Doctor burnishing pads. 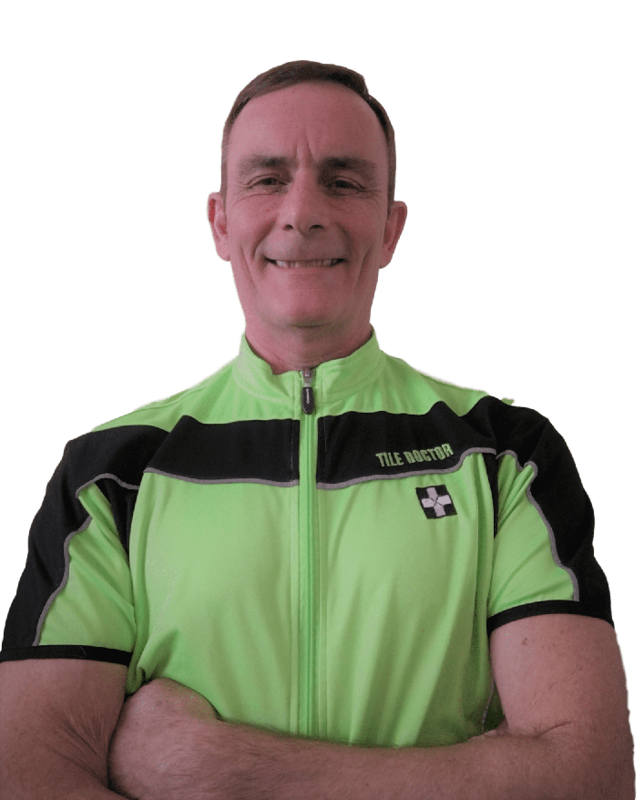 Before starting I pre-wetted the floor with water which was sprayed onto the tiles and then applied the 400-grit pad run over the floor ensuring to pass over each tile four times to get an even result. The fine slurry generated was rinsed off with water and the process repeated with the 800, 1500 and 3000 grit pads, to further hone the stone and restore its polished appearance. With two areas to work on the polishing process took up most of the second day. 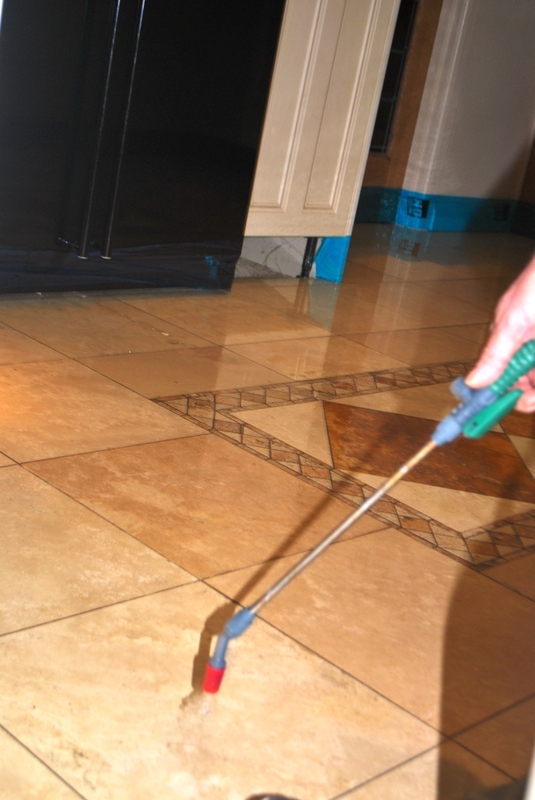 After inspecting the floor on day 3, I set about applying Tile Doctor Shine Powder to the whole floor. This is a crystallising powder that is applied to the floor and buffed in with a red pad. 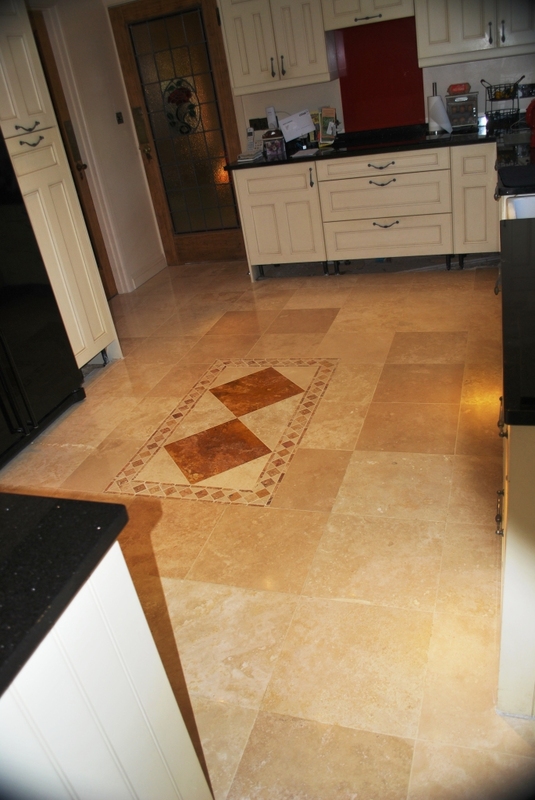 It adds a very high shine to the tiles and provides a tough durable finish. The final result was quite a transformation and what better welcome home present for the client when they returned from their holiday.